Motorcyclist killed on Market St.
Houston Fire Department cleans up the accident scene on eastbound Market Street, near the intersection with I-10 and Uvalde. A 44 year old male died when he lost control of his motorcycle after striking the curb. NORTH SHORE – A motorcyclist died in a fatal traffic accident in North Shore. 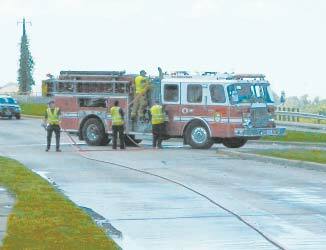 The accident happened at 13400 Market Street, near I10 about 11:45 a.m. last Thursday morning, April 10, 2014. According to the Houston Police Department, a 44-year-old man was driving a Honda motorcycle eastbound on Market Street when he failed to maintain a single lane and struck a curb. He was pronounced dead at the scene. It was reported that a pickup truck may have been involved in the accident; however, there are some discrepancies, and a HPD report states that no other vehicles or individuals were involved in the accident.